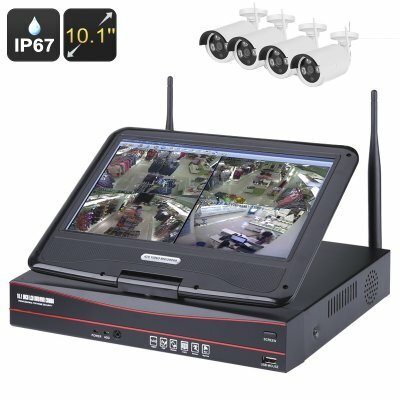 Successfully Added Wireless 4 Channel NVR Kit - 4x 720P IP67 Cameras, 10.1 Inch Display, Motion Detection, Mobile Support, H.264 Compression to your Shopping Cart. This 4 channel NVR Kit with Wireless cameras is fully comprehensive security system that's easy to set up and brings HD surveillance to your home or workplace. This all in one package has just about everything you need for state of the art security. The NVR itself has a 10.1 inch monitor and will display the live feed from any or all of the 4 cameras. There are no network cables required to connect each camera as with two large Wi-Fi antennas on the NVR the Wi-FI cameras can easily be connected wirelessly so you can say goodbye to the messing with cables. With the monitor able to rotate a full 360 degree and tilt through 180 degrees you can place the NVR just about anywhere, be it on a desk in your office, security room or mounted on the wall bring great versatility. An HDMI output let you link in additional monitors in case you want to view the feed on a larger display and with support for a SATA HDD up to 4TB there will be no shortage of space to store all the camera footage. Being an NVR kit and with mobile phone support no less means you can access the live feed from anywhere you wish via an internet browser or the dedicated Eseecloud mobile applications that is available for Android and iOS devices. Simply download the App by scanning the QR code and you will have instant easy access to the system remotely, whenever and wherever you may be. With event recording and email notifications you'll always be fully appraised of all goings on. Coming with 4 HD 720P wireless IP cameras you can establish a security system that is second to none. Sporting an IP67 waterproof rating the cameras are suitable for use indoors and out and function clearly down to 0.1 lux illuminations. Having a 90-degree viewing angle these 3.6mm lens cameras can cover a substantial area and the IR LEDs offer up to 15 meters of night vision so your protected 24/7. Having the ability to set up recording schedules and supporting a motion detection with 4 independent areas available to be set for each camera means you can cover all the access points and important areas, such as cash registers and storage rooms to safeguard your business. This Superb 4 Channel NVR kit comes with a 12 months warranty, brought to you by the leader in electronic devices as well as wholesale surveillance systems and security kits..